When Indianapolis Opera presents the world premiere of Happy Birthday, Wanda June—libretto by Kurt Vonnegut, music by Butler Professor of Music Richard Auldon Clark—it will be the culmination of a project that began in the early 1990s, came to an abrupt halt with Vonnegut’s death in 2007, and concluded on Valentine’s Day this year. What happened in between was a collaboration that Clark said he will cherish forever. Clark said the production runs a little more than two hours. He’s especially proud that the music he wrote expresses exactly what’s being said and where the characters are. Here’s more of what he said. 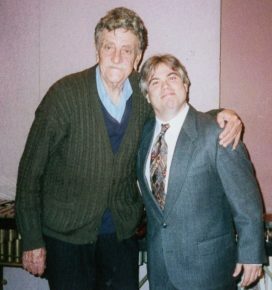 Q: How did you know Kurt Vonnegut? He invited me to meet him at his brownstone—he lived a few blocks from the United Nations—and I became a frequent visitor there. We just hit it off. I brought composers to him to create projects. We did Breakfast of Champions, Mother Night, “Ice-9 Ballads” from Cat’s Cradle. I brought him a composer (Seymour Barab) to redo the Requiem—it’s called the “Cosmos Cantata,” and we’ll be performing that September 10 (5:30 PM in the Basile Opera Center, 4011 North Pennsylvania Street) with Butler University students—and then he gave me his opera. Q: Did he decide that Happy Birthday, Wanda June should be an opera? A: It was his idea. I had never even thought about it. I reread the play, and I thought he would want one of the other composers I brought to him. I never pushed myself as a composer with him. But he said, “I think you should turn this into an opera.” I’d never written anything that big. I write chamber music. I said, “Would you help me adapt the play for an opera?” He said, “Absolutely.” He wasn’t going to write a brand new libretto, but he was in the driver’s seat for it and wound up writing a brand new ending. Otherwise, not a word of the play was changed. All we did was cut dialogue so a singer could have an aria. Q: You knew him before you came to Butler. What did he say when you got the position here? A: He was very fond of Butler, and he loved Indianapolis. He was thrilled that I was taking it. That’s when he said, “That’s where the opera should have its world premiere in Indianapolis, not in New York. And that blew me away. I never tried to pursue it in Indianapolis. I just always assumed I would do it with my New York group (the Manhattan Chamber Orchestra) and try to get singers and a director. But because of a series of wonderful connections, the stars aligned and it’s happening in Indianapolis—as it should be. Q: He died in 2007. What happened after that? A: I felt lost with the project when he died. I didn’t touch it again until 2014. The libretto was done, but not a note of music had been written. Every once in a while I would sing one or two lines of dialogue to him and he’d wheeze and say, “You’re no singer, Bub.” The only thing he really knew of the music was that the opening prologue was going to have a kind of late 1960s/early 1970s popish, light comedy theme like The Odd Couple or The Brady Bunch because I wanted to lure the audience in with the expectation that this is just a funny little story. She sings, “This is a simple-minded story about men who enjoy killing and those who don’t.” I wanted people to feel that this is accessible, familiar music. You’re going to have a nice time. Then musically, I can twist your guts like he does with the story. I had the opening theme in my head for probably 10 years before I wrote a note of it. I wrote that first note—that G-sharp—January 1, 2014, when I began my sabbatical from Butler. But it had been percolating a long time. I finished it February 14, 2016. Q: It has to be amazing for you to have something you’ve worked on for so long finally finished and ready to premiere. A: It’s funny—I wondered how I’d feel when I finally finished the work, and it was such an emotional breakdown. When I wrote the last orchestrated note, I just lost it completely. It was unreal. I had such a connection with this man. He was my idol. I never thought I’d meet him, and then when I met him, we had this collegial relationship. Then it got friendly. And then it was like family. He was a mentor. What I respected about him the most was here was one of the most famous authors in 20th century American literature talking to some kid. I guess I was 28 at the time. And he accepted me. He really didn’t like to be around people very much—he liked to be solitary—but he let me in because he loved music, and he loved talking about music with me, and he could tell that I loved books, and he loved talking about books. 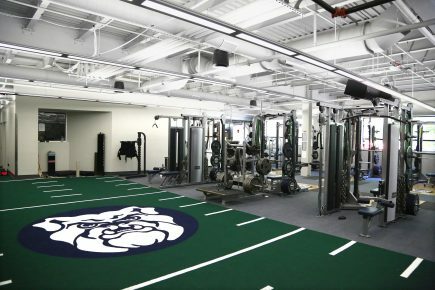 The old pool section of Hinkle Fieldhouse, which has been converted into a weight room, training center, and administration offices, has received LEED Gold certification from the U.S. Green Building Council. The removal of the pool was part of the $34 million renovation of Hinkle Fieldhouse, which took place in 2013-2014. This is Butler’s third LEED Gold project, following the addition to the College of Pharmacy and Health Sciences Building and the construction of the Howard L. Schrott Center for the Arts. LEED certification was developed by the U.S. Green Building Council to provide building owners and operators with a concise framework for identifying and implementing practical and measurable green building design, construction, operations, and maintenance solutions. -Adding a new roof with a white cap sheet that reflects, rather than absorbs, sunlight, reducing the urban heat island effect. -Including bicycle storage and changing rooms, which encourage alternative transportation to Butler University by means other than automobile. It is estimated that at peak times, the project can host up to 162 individuals. To accommodate this number of people, racks that can hold 24 bicycles are located outside the main entry. Inside the building, showers and changing facilities for men and women are accessible to the student and faculty population who have access to the project area. -Water-efficiency efforts, including low-flow fixtures. -Heating and cooling efficiencies. The building uses variable volume air systems, which slow the airflow down if the space temperature is satisfied. This saves a significant amount of fan energy throughout the course of a year. The heating and cooling is provided by hot and chilled water piping loops. The heating loop uses low temperature water, which allows a Dedicated Heat Recovery Chiller (DHRC) to be used. This device, a significant energy saver, lowers the temperature of chilled water while simultaneously increasing the temperature of the hot water. -Signing a two-year contract to purchase at least 35 percent of the building’s electricity from renewable sources. -Reducing the amount of waste that has to be landfilled by collecting paper, corrugated cardboard, glass, plastics, and metals for recycling. -Diverting 97 percent of the construction waste from the project from the landfill. -Using recycled content in the construction. Nearly 35 percent of the building products are recycled content. -Purchasing building materials locally, which cut down on energy usage and pollution associated with transportation. Nearly 77 percent of the building products were manufactured regionally. -Providing additional air ventilation to improve indoor air quality for improved occupant comfort, well-being and productivity. -Controlling and limiting the sources of chemicals and pollutants being released into the general atmosphere, which was accomplished by: putting down walk-off carpet for the length of at least 10 feet at each entryway to remove soil and other particulates from the soles of shoes; sending exhaust from all rooms that can potentially produce hazardous or irritating air directly to the outside; and equipping all air-handling units with highly efficient filters. First-year student Nick Bantz braved the weather on Saturday morning to give his time to the Indianapolis community as part of Bulldogs Into the Streets, Butler’s annual day of service. Bantz and his fellow volunteers were assigned to the MLK Community Center just a few minutes from campus. The center serves youth, families, and seniors in the neighboring community by providing a variety of programming, including homework assistance, leadership development, grief counseling, and job training. The volunteers were busy organizing donated winter coats, painting walls, decorating windows, and taking down a broken book shelf. Bantz, a chemistry and pre-med major from Muncie, Indiana, wanted to participate in BITS after learning more about Indianapolis during another program he was a part of during Welcome Week. 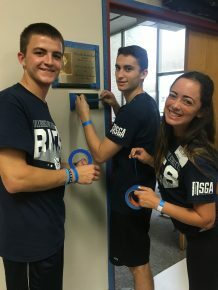 Last year was the first time that the program was open to all volunteers, including new and returning students, faculty, staff, alumni, and members of the Butler community. The numbers are already growing from last year, with over 1,200 volunteers giving their time to 50 sites around Indianapolis and the surrounding areas. Brighid Smith is the Public Relations Director for BITS this year. She has seen the benefits of expanding the program firsthand through her past experience as a volunteer. Although a few outdoor activities were canceled due to heavy rain, there was plenty of work to do indoors all around the city. Some groups were busy painting and cutting cardboard for animals at the Indianapolis Zoo. Other groups went to the Ronald McDonald House to help clean and organize their storage space. One group stayed on campus and packaged around 20,000 servings of food for the Million Meal Movement. Smith said she has enjoyed her participation in BITS both as a volunteer and a leader. She believes it is a great way for first-year students to get involved on campus and in the community. Over 1,200 volunteers participated in Butler’s annual service program, Bulldogs Into the Streets. Instead of packing up for college in the weeks leading up to move-in day, incoming first-year student Stephanie Hannon was busy mastering the London Tube System and navigating the streets of Paris. 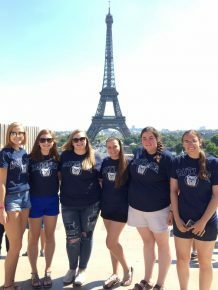 She and six other incoming first-year students were given the opportunity to explore two European cities through Butler’s first International Travel Pre-Orientation program. The 10-day program took place in mid-August and was designed to help incoming first-year students build confidence in traveling abroad at the start of their college career. Hannon said she also got to build friendships with some other new Bulldogs. Director of Study Abroad Jill McKinney led the inaugural program in coordination with Butler’s new initiative called Themed Living Communities (TLCs). This program lets students choose a TLC that suits their interests and then places them in their on-campus housing unit with students who share similar interests. McKinney created a TLC called “Go Global!” for students who want to explore cultures around the world and build interest in international travel. In thinking of thematic programming ideas for the “Go Global!” TLC, she came up with the idea to take some of the students on an abroad experience, and the program was born. The group of students spent half of their time in London and half in Paris. They visited the University of Westminster and the University of Oxford, two schools that they could potentially study abroad at in the future, and they explored major sites including Trafalgar Square, Buckingham Palace, Big Ben, the Eiffel Tower, and the Notre Dame Cathedral. They also got to meet with Butler alumna Laura Anderson ’15, who was a College of Communication major, studied abroad, and now lives in London. 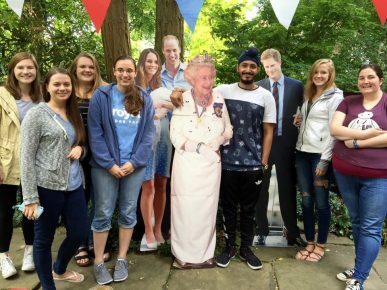 She welcomed the group and spent time advising them on Butler, studying abroad, and post-grad options. 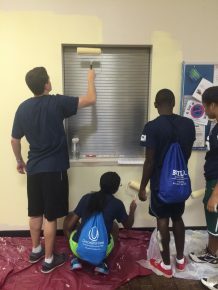 To create the program, McKinney partnered with institutional partner IFSA-Butler, which provides study abroad opportunities for students in multiple countries around the world. The students on the trip were able to meet the IFSA staff in London and learn about the support services the organization provides for American students who are studying abroad. McKinney believes that the students in the program began to envision themselves in a future study abroad program because of this experience. Butler’s first International Travel Pre-Orientation program gives students a chance to study abroad before they start school. Bekah Pollard ’16, an Art + Design major, has been awarded a 2016 Arts Council of Indianapolis Arts Journalism Fellowship to produce stories for The Indianapolis Star. Pollard and the two other fellows chosen for the fall “will work with IndyStar reporters, editors and photographers to tell stories across different platforms, including digital and print,” the newspaper reported. The Arts Council of Indianapolis Arts Journalism Fellowship Program awards $2,000 fellowships to three qualified and talented students (undergraduates and post-undergraduates) to research and write engaging articles or create content and videos on artists and arts organizations in music, dance, theatre, literature, media, and/or the visual arts. The Arts Council administers and helps fund the fellowship program. The Star, which makes all editorial decisions, pays the students per article, as freelance correspondents. The program is in its second year. The mission is to increase coverage of the people, events, and organizations that contribute to the cultural life of central Indiana while training and supporting the next generation of arts journalists, the paper reported. Pollard graduated with high honors in Art + Design, English Creative Writing, and Gender, Women, and Sexuality Studies. 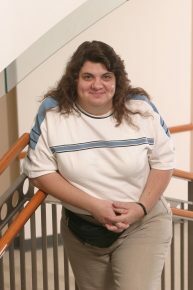 Throughout her time at Butler, she worked as a contributor and editor for Butler’s humor magazine Archives, as well as the University’s fine art and literary magazine, Manuscripts. She has shown her artwork regularly on Butler’s campus and in several galleries throughout Indianapolis in the past few years. 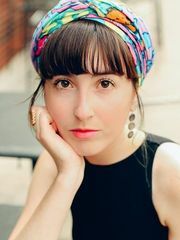 She also worked as a contributing editor for the website thelala.com, and most recently writes arts articles for leapreview.com. She is originally from Peoria, Illinois. The mission is to increase coverage of the people, events, and organizations that contribute to the cultural life of central Indiana while training and supporting the next generation of arts journalists, the paper reported. Butler University has been awarded a $600,000 Indiana State Department of Health grant for a two-year project to determine whether dementia patients’ lives can be improved through the use of personal musical playlists. In the project, called Music First, faculty and students from across Butler—in Psychology, Music, Pharmacy, Communication Disorders, and other areas—will team up to study 100 residents in the American Village retirement home throughout the 2016-2017 academic year. Additional locations will be added in the spring for the second phase of the study. Butler researchers will create playlists of at least 20 songs that the patients enjoyed when they were in their late teens and early 20s. The songs will be put on an iPod Shuffle, and the patients will listen through headphones so they have an intimate experience with the music. The hope is that the music will calm the patients, reduce the use of black-warning-label medications, and relieve some of the pressure on caregivers. The idea for the project began about five years ago when Music Professor Tim Brimmer, Psychology Professor Tara Lineweaver, and others began discussing the idea of an interdisciplinary project between music and science. “The Neuromusic Group,” as they called themselves, started working with residents of Rosewalk and Harrison Terrace, an all-dementia nursing home. While they were completing their second study at Harrison Terrace, the Indiana State Department of Health asked if they could expand their research. While designing this larger, renewable study, the Neuromusic Group began offering a course called The Neuromusic Experience, working with Joy’s House Adult Day Service, where they established and improved the protocols from the first two studies. In the beginning of the study, the music will be used in late afternoon and early evening, when dementia patients exhibit signs of “sundowning”—a tendency to become confused or agitated. Brimmer said the researchers will be looking for a reaction in the patients’ rate of speech, physical movement, and clarity of responses. They also will be looking to see if the patients sing or dance, and how long the effect of the music lasts. Although music therapy has been used with dementia patients, this study is different because it uses music specifically targeted for each patient. Lineweaver said the early work at Rosewalk, Harrison Terrace, and Joy’s House found that music has some calming influence on the patients. But the studies have only been for three months each, which isn’t long enough to be able to document any improvement in medication regimens. The nine-month study at American Village should yield broader, more substantial results, she said. 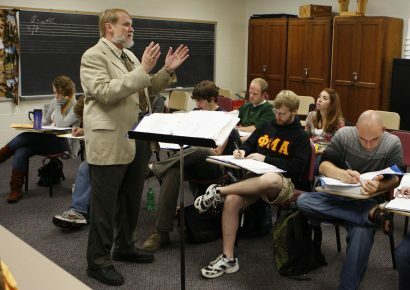 Because the Neuromusic Experience course involves students in the Music First research project, it has been approved as satisfying the Natural World component of Butler’s core curriculum—a component that helps non-science majors deepen their understanding of the scientific method through first-hand experience and discovery-based learning. The course also satisfies the Indianapolis Community Requirement of Butler’s Core curriculum because it immerses students in a learning environment that helps them better understand themselves and their roles as citizens in a diverse and interdependent world. 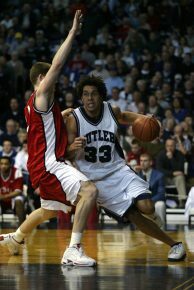 The Butler Family lost one of its favorite Bulldogs with the passing of Joel Cornette. One of the most popular student-athletes in Butler history, he was known for his outgoing personality, quick wit, trademark smile, and toughness that so many identify with Butler teams, especially of his era. He embodied The Butler Way. The outpouring of support from those who knew Joel well and those who appreciated his true love for Butler has been remarkable. In partnership with the Cornette Family and as one of the ways to celebrate Joel's legacy, Butler University has established the Joel Cornette Scholarship Fund, which will provide scholarship support for future Butler Bulldogs. Contributions in Joel's honor may be made online at https://www.butler.edu/cornette or by check to Butler University Advancement, 4600 Sunset Ave., Indianapolis, IN 46208. Please reference "Joel Cornette Scholarship Fund" in the check memo or online designation field. Thank you for helping us honor Joel and provide support for future Bulldogs. Cornette, who was a key member of Butler's first Sweet 16 team, passed away suddenly on August 16 due to natural causes. He was 35. On the court, Cornette helped the Bulldogs to a record of 100-30 in his four seasons (1999-2003). 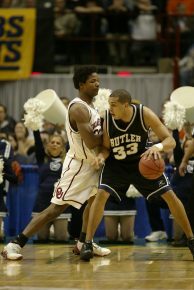 Butler made three NCAA Tournament appearances in his four years, including the program's first Sweet 16 in 2003. The Bulldogs also made the NIT in 2002. He scored 1,100 career points and pulled down 712 rebounds, marks that are 33rd and tenth respectively in Butler history. His 144 career blocks and .544 career field goal percentage also rank among the Top 10 in Butler history. Cornette was named to the Midwestern Collegiate Conference/Horizon League All-Defensive Team in 2000-01, 2001-02 and 2002-03. He earned second-team All-League honors in 2002-03. Cornette served on the Butler coaching staff for the 2006-07 season as the team's coordinator of basketball operations before going to Iowa as a member of Todd Lickliter's staff. Cornette grew up in Cincinnati, Ohio, starring for St. Xavier High School. An NBPA-certified player-agent, Cornette served as the Director of Basketball Recruiting at Priority Sports since January, 2012. A celebration of Joel Cornette's life will be held at Hinkle Fieldhouse on Monday, August 22, at 11 AM. He was known for his outgoing personality, quick wit, trademark smile, and toughness that so many identify with Butler teams, especially of his era. He embodied The Butler Way. 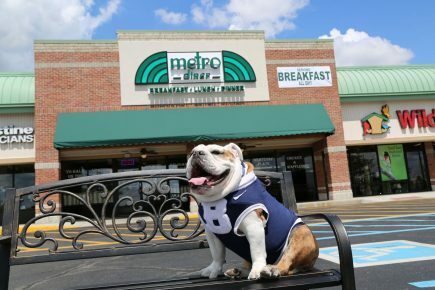 Butler University has signed Metro Diner to be its third retail customer in the Sunset Avenue Parking Garage. The Jacksonville, Florida-based restaurant is scheduled to open a 3,800-square-foot location in early December next to Scotty’s Dawghouse and Pita Pit at 4702 Sunset Avenue. Metro Diner’s menu features “comfort food with flair”—items such as fried chicken and waffle, “Yo Hala on the Square” (two thick slices of challah bread stuffed with bananas, brown sugar, cream cheese and hazelnut syrup, prepared like French toast), and a signature meatloaf plate. The average check is $12 per person. The Butler-based Metro Diner will be the company’s third in Indianapolis. One is at 3954 East 82nd Street, and the second is set to open at 7225 U.S. 31 on the southside. The Butler-based Metro Diner will be the company’s third in Indianapolis. Butler University alumni are thriving personally and professionally, according to the Gallup-Purdue Index, a national survey of college graduates conducted by the Gallup Organization. Butler outperformed its peers across most items in graduates’ assessment of their student experience including faculty support and experiential learning, affinity for their alma mater, and overall well-being. The Gallup-Purdue Index measures the degree to which graduates have successful and engaging careers, and whether they are thriving in their overall well-being. It also emphasizes the undergraduate experiences that most substantially influence these outcomes. 82% of Butler grads agree or strongly agree it was the perfect school for them—a rate 15% higher than the national average. Nearly 80% of Butler grads have attained careers in which they agree or strongly agree they are deeply interested in their work. Approximately 2/3 of Butler grads agree or strongly agree they have the ideal job for them, surpassing the national average. 94% of Butler grads agree or strongly agree their professors made them excited about learning as a student on campus. Nearly twice as many Butler grads were extremely active in extracurricular activities on campus than graduates nationally. 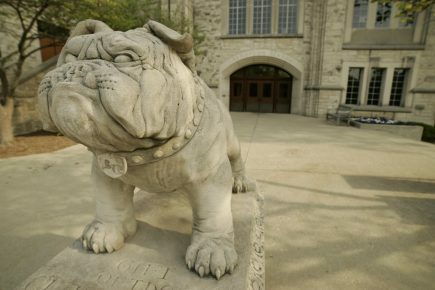 Butler also participated in the first statewide Gallup-Indiana Graduate Satisfaction Survey, coordinated by the Indiana Commission for Higher Education (ICHE), which revealed that 90% of alumni agree or strongly agree they are satisfied with the education they received at Butler and 81% agreed or strongly agreed that they were well prepared for life. This marks the second year of the Gallup-Purdue Index, which is an annual national survey of alumni who received their undergraduate degrees. Results are based on surveys conducted online from December 16, 2014 to June 29, 2015, from a random sample of 30,151 respondents living in the U.S. with a bachelor’s degree or higher. The Gallup-Indiana Graduate Satisfaction Survey included more than 22,000 graduates from 13 Indiana public and private colleges that volunteered to participate. Butler’s results are based on online surveys conducted from February 22 to March 22, 2016 with a sample of 4,696 Butler University undergraduate degree alumni. The Gallup-Indiana survey was conducted in partnership with ICHE and USA Funds. View Butler’s complete survey results here. 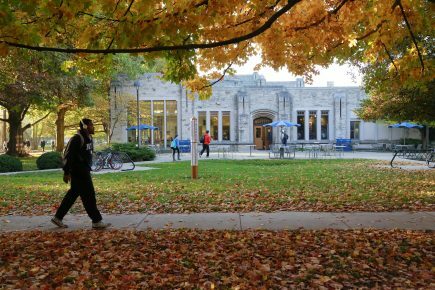 Butler outperformed its peers across most items in graduates’ assessment of their student experience including faculty support and experiential learning, affinity for their alma mater, and overall well-being. A celebration of Joel Cornette's life will be held at Hinkle Fieldhouse on Monday, August 22, at 11 a.m. The service is open to the public. Doors will open at 10:30 a.m. Attendees are invited to park in the main Hinkle lot (please utilize the parking garage near Scotty's Brewhouse if the main Hinkle lot becomes full). Please enter through Gates 2 and 3. Cornette, who was a key member of Butler's first Sweet 16 team, passed away early on the morning of August 16 due to natural causes. He was 35. One of the most popular student-athletes in Butler history, he was known for his outgoing personality, quick wit, trademark smile, and toughness that so many identify with Butler teams, especially of his era. He embodied The Butler Way. Tributes to Cornette can be found here and here. NCAA Tournament appearances in his four years, including the program's first Sweet 16 in 2003. The Bulldogs also made the NIT in 2002. He scored 1,100 career points and pulled down 712 rebounds, marks that are 33rd and tenth respectively in Butler history. His 144 career blocks and .544 career field goal percentage also rank among the Top 10 in Butler history. Cornette was named to the Midwestern Collegiate Conference/Horizon League All-Defensive Team in 2000-01, 2001-02 and 2002-03. He earned second-team All-League honors in 2002-03. Cornette served on the Butler coaching staff for the 2006-07 season as the team's coordinator of basketball operations before going to Iowa as a member of Todd Lickliter's staff. Cornette grew up in Cincinnati, Ohio, starring for St. Xavier High School. An NBPA-certified player-agent, Cornette served as the Director of Basketball Recruiting at Priority Sports since January 2012. One of the most popular student-athletes in Butler history, he was known for his outgoing personality, quick wit, trademark smile, and toughness that so many identify with Butler teams, especially of his era. He embodied The Butler Way.